…or me, and I’m terrified of mice! It was originally written in 1989 by the then conductor of Luxembourg’s military band to celebrate NATO’s 40th anniversary. Why it’s survived so long is anyone’s guess. But give it a listen above, as it does at least add to the list of very bad songs adopted as anthems by international bodies, see the UN’s for an even worse example. Has Kurdistan just given the world its newest national anthem? Kurdish voters! Why can’t we have that inky finger in the UK? Kurdistan – at least the bit of it in Iraq – has voted for independence. Go them! Which means one of two things: either the Middle East is about to have its most earth-shattering moment since the creation of Israel, or the US will tell the Kurds to shut up and it’ll have to stay awkwardly part of Iraq for a few more years (here’s a good analysis explaining both possibilities). But one thing’s certain whatever the outcome: Kurds will keep singing Ey Reqib – Oh, Enemy! – as if they already have a national anthem. “Oh, enemy! The Kurdish people live on / They have not been crushed by the weapons of any time,” goes the song, written by the poet Dildar while in an Iranian jail in 1938 (he was locked up for campaigning for independence). When researching my book on anthems, I considered a chapter on Kurdistan – I liked the idea of looking at the power of national anthems in countries that didn’t exist – and did some initial research by visiting Bayan Rahman, the Kurdish government’s representative in the UK. “It was written at a time when Kurds’ language wasn’t recognised, when people were trying to deny the existence of Kurds at all in Turkey. A few months later I went to meet her a second time – ISIS were bearing down on Erbil and I was trying to get access to the Peshmerga’s front lines so I could see if they sang Ey Reqib in battle. And that time, for some reason, she was far more open about the role the song had played in both her life, and the wider independence movement. Bayan’s father had been a senior member of the Peshmerga and went on to be a successful politician until he was killed by a suicide bomber in 2004. Bayan smiled while telling me about him, and suddenly remembered a night in the ’70s when he woke her and her brother, dragged them outside where all the adults were partying, and made the two children sing, while recording it all on a tape player. “You would think that at that age we would be singing nursery rhymes, like Humpty Dumpty or whatever. But we were singing Peshmerga songs. “My father was a Peshmerga. We’d lived in the mountains and we had guns in the house and he’d come home with his Kalashnikov, and so we had grown up with all that, seeing them sing before they went off to battle. So he made us sing like them. “And then my brother and father were killed in 2004, and my mother used to play that tape [over and over]. “Yes, I definitely think of them and others who have been killed when I sing it, because they were killed because they believed in it. That quote tells you everything about the strength of feeling in Kurdistan and the power of anthems. Whether Kurdistan becomes independent or it has to stay part of Iraq, neither the anthem nor the desire is going anywhere. Gambia’s in crisis, if you’ve missed the news, with its president, Yahya Jammeh, refusing to end his 22-year rule despite having lost an election and even admitted doing so. He’s got the army’s backing. Things don’t look like they’re going to end prettily. But on the plus side, this does give me a chance to look at the country’s national anthem! The bad point? It’s awful! It was written by the country’s former British administrator, Sir Jeremy Howe, with lyrics by his wife. Which is why it doesn’t sound very Gambian. In fact, it sounds more suited to the Yorkshire Dales than tropical Africa. But there is one good point in light of the current crisis: the lyrics. Jammeh seems to be ignoring every word of that. Here’s hoping he listens soon. Olympic anthem of the day #17: Japan! What was the best anthem at the lympics? Going by Twitter, it was Japan’s, and by a mile. And every one those comments was right. I know far too much about Japan’s anthem having travelled across that country while researching my book on these songs. 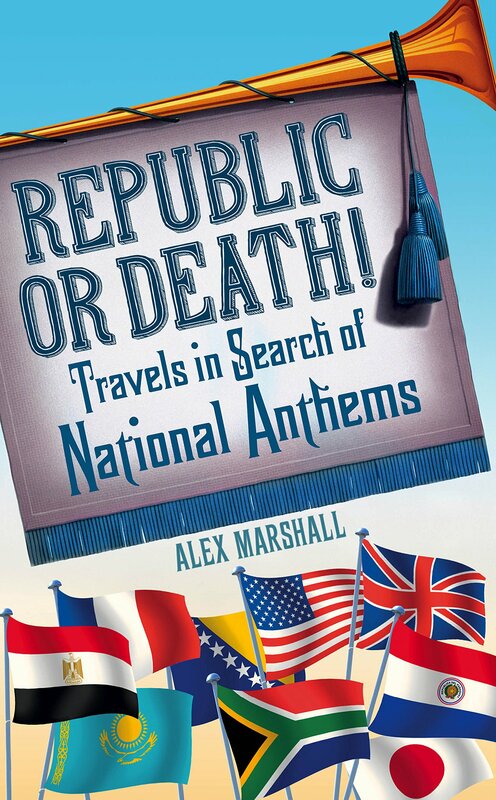 And it’s not just the world’s most beautiful anthem, it’s also its most controversial, with a deeply sad story behind it, filled with politicians hounding people to stand and sing, even though the anthem’s associated with the country’s militaristic past. Who’s been one of the main politicians behind that hounding? Shinzo Abe, Japan’s prime minister and a man who featured prominently in last night’s Closing Ceremony, appearing as Super Mario just moments after Japan’s anthem was sung (that’s him in the photo). Which city in Japan’s got the worst anthem laws? Tokyo, whose new right wing give it was also at the ceremony. I look forward to hearing Japan’s anthem a lot over the next few years, but I hope Abe doesn’t try to pass any more laws trying to force people to respect it. Hosting the Olympics is always a time for national pride, but it’s never a time to blindly force that pride on a population. Olympic anthem of the day #16: Tajikistan! This is what someone looks like after just throwing the hammer 78.68 metres. I was expecting more sweat! The composer of Tajikistan’s national anthem, Suleiman Yudakov, didn’t have the greatest start in life. He was an orphan and a Bukharan Jew – two groups that didn’t fare well in the Soviet Union. But he fell so hard in love with music, he studied it until he was admitted into Moscow Conservatory, then into the ranks of the Soviet Union’s leading composers. Dilshod Nazarov, the Tajik winner of the men’s hammer at the Olympics (that’s him in the picture), probably doesn’t know that story, but I imagine he can identify with Yudakov’s life. Dilshod, himself, beat enormous odds to win his country’s first ever gold medal. Age 34, in his fourth Olympics, an old man of the sport, he wasn’t expected to win, but did, showing just what you can do if you work hard. What’s the country’s anthem actually sound like? Tajikistan was one of nine countries to win their first ever Olympic gold medal at Rio along with Singapore, Kosovo, Côte d’Ivoire, Puerto Rico, Jordan, Fiji, Bahrain and Vietnam. You can hear all their anthems by clicking on those links! Only 59 anthems were played in all, which is pretty rubbish when you think that’s only about a quarter of the world’s songs, but that’s sport for you. Olympic anthem of the day #15: Ivory Coast! With a bonus Jordan! If any moment this Olympics taught me you have to keep going until the last moment, it was the men’s -80kg taekwondo final. It was all over British TV because our athlete, Lutalo Muhammad, was expected to win, but then in literally the final second, Côte d’Ivoire’s Cheick Sallah Cisse kicked Lutalo in the head and sprinted off, running laps and laps of the arena, perhaps the most excited person to win gold at this whole Games. It was the first time Côte d’Ivoire’s ever won a gold, which means it was also the first time most TV viewers got to hear the country’s anthem, L’Abidjanaise – bizarrely named after the city of Abidjan even though it’s no longer the country’s capital and the song has nothing to do with it. Was it worth the wait? If you like drunken French military marches, which almost lurch from one bar to the next, then yes! But if there’s actually a reason to give it a listen, it’s the lyrics, which almost beg the country to work harder, as if words alone can overcome all its problems. Ok, it’s a bit like a greeting card, but stop complaining and go and win a medal yourself! Bonus anthem: The taekwondo arena proved a great place to hear anthems for the first time this Olympics. Jordan won its first-ever medal there too when Ahmad Abughaush (that’s him below), a 20-year-old student, won the featherweight class. What’s the country’s anthem like? Well, given its chorus translates as “Long live the King / Long live the King / His position is sublime / His flags wave in glory supreme,” let’s just say it could do with having a message like Côte d’Ivoire’s.